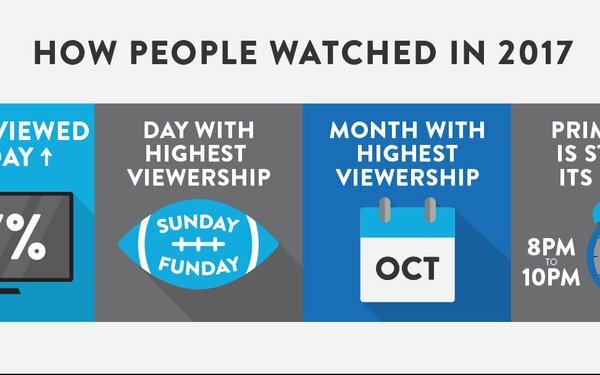 Sunday is the number-one day for streaming video, according to Dish's Sling TV, while the prime-time hours of 8-11 p.m. remain the most popular hours to watch streaming TV. Sling TV's data suggests that while over-the-top streaming video services may still be nascent, the viewing habits they engender remain very similar to those for traditional television platforms. Sunday has long been the most popular day to watch TV, and prime time is called that for a reason. So the data from Sling should be reassuring to programmers and advertisers that would otherwise be concerned these OTT services are dramatically changing viewing habits. Sling's data did hold a few surprises, however. Just as Netflix subscribers regularly discover and binge classic shows, Sling subscribers turned to a few long-running favorites as well. The most popular shows based on hours viewed were HGTV's "Fixer Upper," followed by "Law & Order: SVU" and History's "American Pickers." "Fixer Upper" was the most popular show on Sling in 31 states. The most recorded show on Sling's Cloud DVR was AMC's "The Walking Dead." Live sports also remains a big draw, whether on a streaming service or a traditional pay-TV service. In Sling's case, five of the six times it broke a viewership record this year, football was being played. Either NFL or college football was the most popular sport to watch on Sling in 32 of the 50 states. The data suggests that consumer viewership habits are not changing as much as some would believe. For advertisers and marketers, it means that traditional TV programs bought and sold in traditional time slots may remain solid investments in the long term, even if many of those ads may be purchased programmatically in the near future. For programmers, it means that classic formats still have appeal. For companies trying to break through with OTT bundles of their own, it suggests that a wide variety of programming, spanning classic genres to newer concepts, is key to success. You can see Sling's full 2017 recap here.